Princess Haven was never meant to be queen. Her immortality has saved her time and time again, but when the last of her royal family dies at her feet, she is next in line to rule a nation on the brink of war. 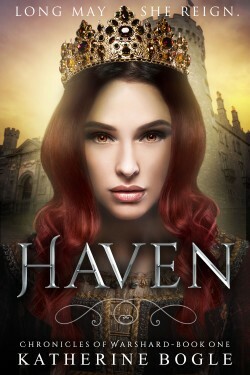 With no formal training, Haven must rise to the occasion with the help of her personal guards, or risk losing everyone she has ever loved. Between assassination attempts and brutal scare tactics, the evil tyrant Kadia’s army is fast approaching. Haven’s neighbors are quick to fall under the swords of Kadia’s shadow soldiers, leaving a sea of bodies and a clear path to Haven’s only home. Haven must make a choice; take her people and flee to the foreign Republic across the sea or lead a last stand against a powerful dictator.